Product prices and availability are accurate as of 2019-04-17 13:03:03 EDT and are subject to change. Any price and availability information displayed on http://www.amazon.com/ at the time of purchase will apply to the purchase of this product. 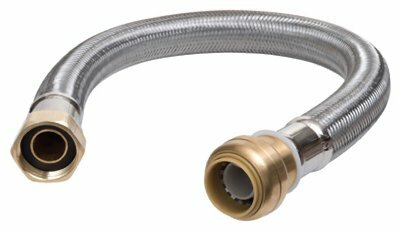 3/4" x 3/4" Female Iron Pipe x 18", Stainless Steel, Lead Free, Braided Water Heater Connector, Sharkbite Push Fit Fittings For Use With Copper Tubing Copper Tube Size, CPVC & Pex, With Integral Tube Liner Included, Constructed Of DZR Brass, Certified To 200 PSI & 200 Degrees Fahrenheit, Design Certified To ASSE 1061/NSF61 Standards, Meets UPC, IPC & CUPC Requirements, Fittings Are Listed With IAPMO & Are Certified For Use On Potable & Hydronic Water Distribution, Certified For Underground Applications & As A Manufactured Joint Without The Need For Access Panel, Lead Free Compliant To Federal Law 111-380.